This has been a nice week here at May Dreams Gardens. Out in the garden I harvested the first of the cantaloupe and am up to seven picked so far. I’m eating what I can and sharing some with my neighbor and friends. Cantaloupe isn’t something I grow every year. In fact, I think it has been 10 years since I last grew any, and if I recall correctly, it wasn’t that good of a crop. But I saw some healthy seedlings for sale at the grocery store one day last May and had one open spot in the garden so I bought them on impulse. I’m glad I did! I’ve also been picking a few tomatoes nearly every day, which is why in this harvest picture from this morning you only see four, oops, make that seven or so tomatoes. 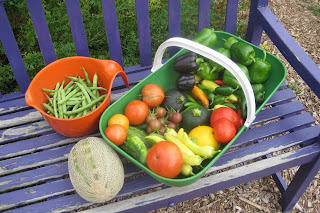 The rest of the harvest includes the usual sweet peppers, hot peppers, squash and green beans. I also got a few more cucumbers, which I expected I would once I picked all the overgrown ones last week. I’m still amazed at how well the cucumbers have done, and that I’m still picking them in late August. This afternoon I worked on some garden clean up - weeding, cultivating and pulling out non-producing plants like the corn and the first planting of green beans. It was a nice day to do it with overcast skies and temperatures in the low 70’s. It was just me and the crickets and cicadas out there, with the occasional slow moving bee going by to half-heartedly warn me if I got too close to the sunflowers. Outside the garden this week, some other nice things happened, too. Monday morning, I was reading the paper and saw that I was quoted in a little piece on miniature gardens. The author apparently found out about my miniature garden through Twitter. She tweeted asking if anyone knew of gardeners with miniature gardens, someone tweeted back to check Indygardener (that’s me) and so the connection was made. I also had great fun hosting a give-away of a short-handled Cobrahead weeder. Right before I was to pick a winner, the generous family behind the Cobrahead company contacted me and told me they are going to send a weeder to everyone who entered. Isn’t that the best! I hope this week is as nice as this past week was. P.S. The picture above is not one of my schemes to scare rabbits away from the garden, though it might do that as a side benefit. I just wanted to show how I keep a knife out in the garden all the time so if I see a squash to harvest, I have a knife handy to cut it off. Plus, this close up shows how I fix the corners of my raised beds. P.S.S. Here’s a picture of the garden today. You should notice a little difference from past weeks since I cut down the corn at the far end. I guess a knife is necessary to cut through those thick stems. I've always used heavy-duty pruners or loppers, but then I don't harvest nearly as much as you do. Do your hands ever get tired or sore from harvesting? What a hearty harvest you had today, Carol. And no wonder you wanted to be out in the garden with temps in the 70s. That sounds heavenly. 102 here today, and tomorrow we go to once a week water restriction, which means most things are gonna die or be pathetic, so I am so glad to see your bright, lush veggies. I'm glad you had a nice weekend with wonderfully cool temperatures. Your garden has been wonderfully productive. I never even thought of growing cantaloupes when lived in the north. In fact, I/m not sure I had even heard of them. I had a suoer crop here one year but since then they have been duds. Never give up though, I'll be trying again next year. And thank you once again for hosting that competition where everyone was a winner. Your garden is amazing! It's been so hot and dry here in Central Texas it's a miracle that mine has produced anything! Your garden is inspiring and hopefully fall will be a better season for us. Thanks for the great pictures and a dose of hope! Plus, wow you're llike famous now! We keep a pair of garden shears out there hanging on the tool rack rather than a knife. But it is sure great to have an implement. 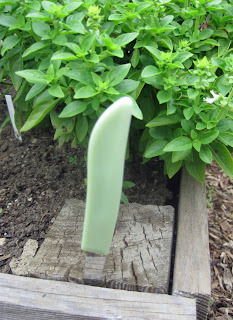 I used to find myself hacking at stems with my trowel or hoe -- not that great a way to harvest, I'll tell you! Hey, that cobra head contest is the kind I like the best, where everybody wins. And we will definitely be winning when we receive such a great tool. I can hardly wait. So, do you have a post about your miniature garden? I'm so lazy I don't want to search through all your archives. . . 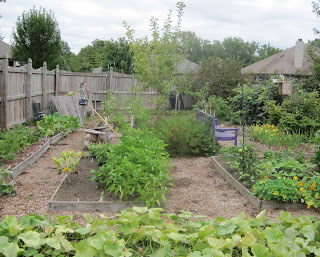 Your veggie garden is looking great. I feel the same way about melons. I always plant them, but they don't always "pay me back". But when they do, oh it is heavenly. This year it was too cold to ripen them correctly and then when it got hot it actually cooked them on the vine. Some years you just can't win.